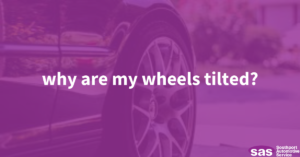 Why Are My Car Wheels Tilted? From the factory, your car is dialed into a number of different specifications that deem it road-worthy and able to operate as it should. This involves everything from engine compression to suspension components and operating temperatures. However depending on a number of factors, specifically in your suspension area, a number of things can become askew. When you find yourself staring at a wheel that isn’t straight, it may puzzle you. However there are a few explanations as to why that phenomenon known as camber might be happening to you. As stated, your car’s suspension is built specifically to handle a number of different things — and a heavy load is included in that. When you’re packing the back seats and trunk with heavy items, your springs begin to compress, which lowers the car a substantial amount. Due to this weight and stress, your suspension will generally begin to pull the top of your wheel and tire inward toward the car. While this isn’t something to worry about with a heavy load, if it’s happening without anything in the car, it might be a red flag. It’s important to know that most cars come with factory camber from the factory, but it’s only a few tenths of a degree. This is hardly recognized by the naked eye, but can certainly be seen if stared at for long enough. Should you have an issue you think needs checking out, make sure you bring it to a shop that has a reputation for quality work and craftsmanship.